There will be a community meeting with Police Services on February 20, 2018. This important meeting will be held at the Lawrence Park Community Church from 6:00 PM to 8:30 PM. Please plan on attending! Mark Saunders, Chief of Police, will be in attendance to speak on behalf of Police Services. Superintendent Rob Johnson will also be present to represent Division 32 and 33. Superintendent Shaun Narine will represent Division 53. 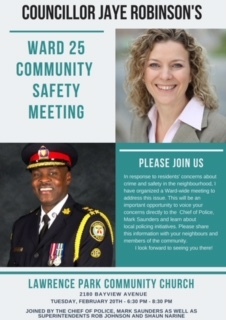 Do not miss opportunity chance to address questions directly to Chief Saunders and three divisional superintendents. The meeting will focus on community safety and crime issues within the area. This will be an important opportunity to voice your concerns directly to City Police Services as well as learning about local policing initiatives.